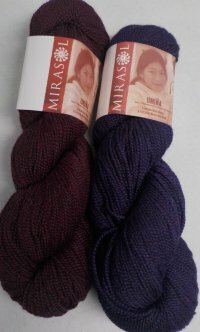 Umina is a lovely alpaca/merino blend yarn that is gorgeous knit up and left unfelted. 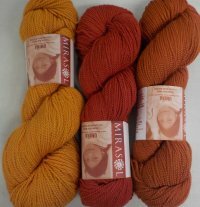 In fact, in a yarn tasting here at the shop in Dec 2018, it was one of the favorites of my new yarns for the fall! My sister thought to felt her sample swatch from the yarn tasting and we were all impressed at how easily it felted (just 1 short cycle) and how flexible the felt still was. 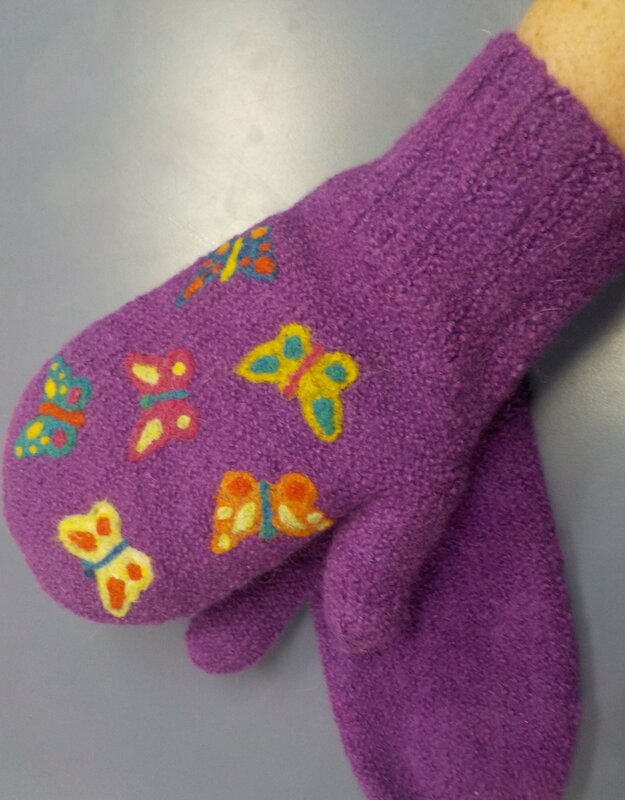 Usually once a yarn is felted it becomes a bit stiff - maybe great for a felt bag or slippers, but for mittens or for a hat which you want to still have some flexibilty -particularly for mittens or gloves so you can use your hands unimpeded - this yarn seemed like a great choice. 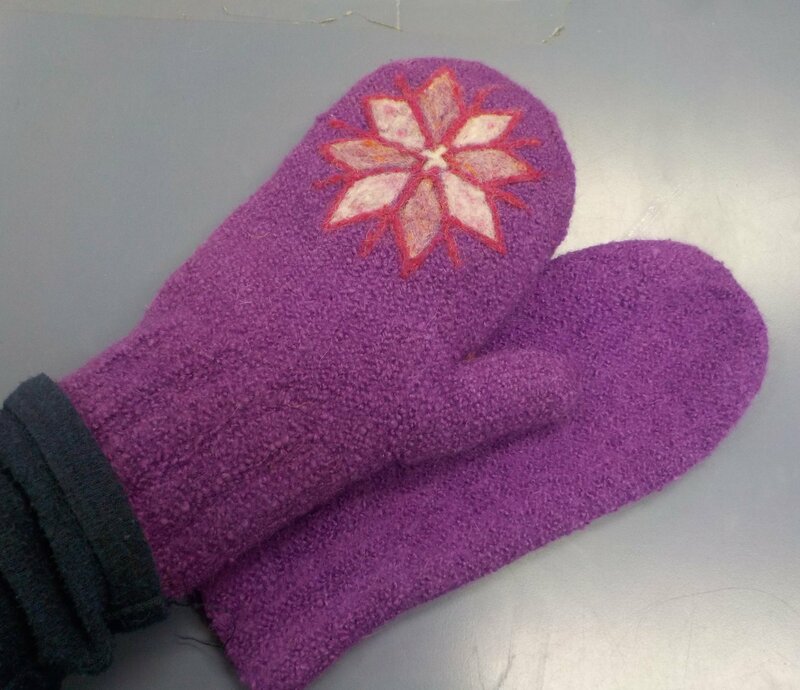 And while it is a "light worsted"/"dk" yarn, these mittens are just as warm as a heavier, clunkier felted pair because they are 50% alpaca and alpaca is 7 times more insulating than wool. And of course it is softer too! So we worked up a mitten pattern for this yarn and decided to "kit" it along with a felting needle and bits of lots of colors (pictured is an example of what the kit contains, but each package has a range of different colors- plenty to choose from) so if you wanted to treat your felted mitten like a "canvas" to paint on you could have a blast embellishing them! If you've never needle felted before - no worries! I've included a link in the pattern to a short video I did that provides you some creative ideas and the 101 Basic How-tos! And if you're worried that you can't "draw", we did up a pair (see butterfly motif below) using cookie cutters! The snowflake I did freehand - and the video gives you some tips for approaching that too. 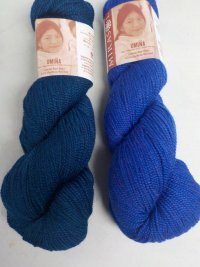 Kit includes 1 skein of yarn (pick your color below), 1 felting needle and a bag of lots of different colors to play with. Plus, of course, the pattern and the video link. 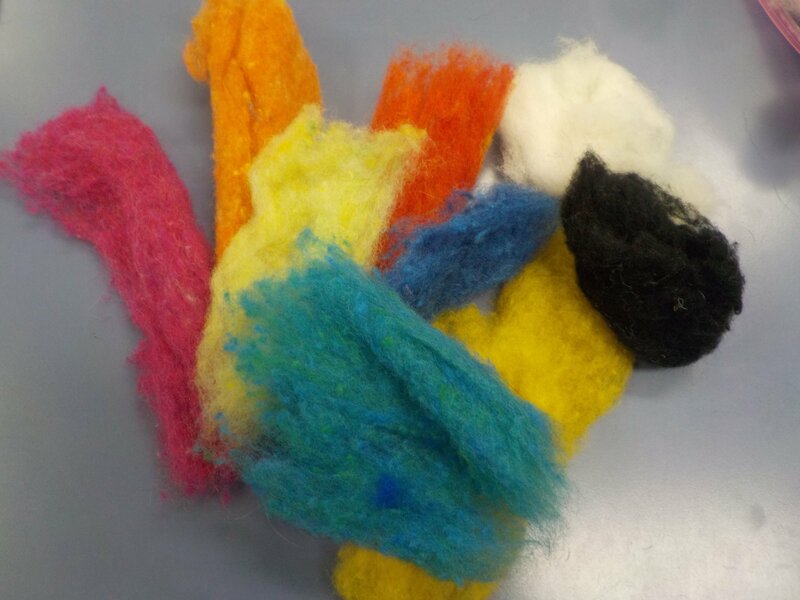 You'll just need a sponge to needle felt into - assuming everyone has a sponge at home, I have not included that! 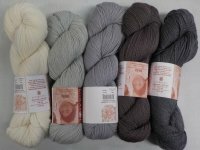 Every package of random fibers includes black, white and grey along with a range of colors which will include some from each part of the color wheel. 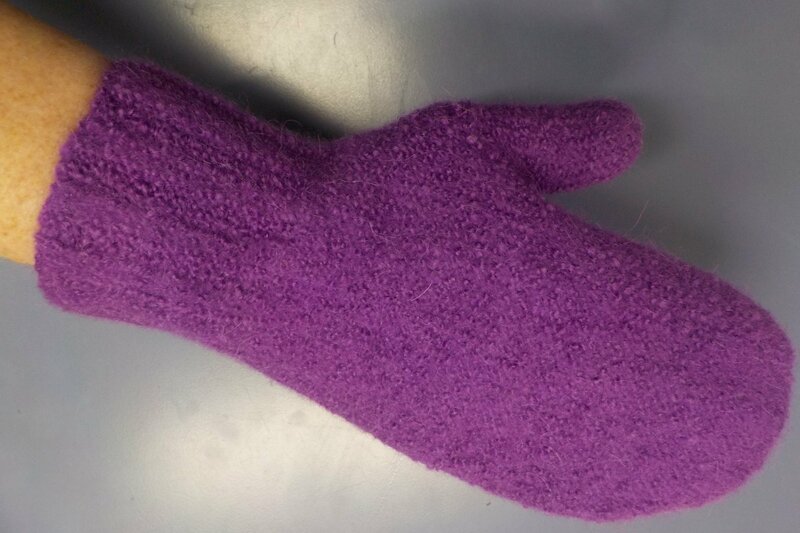 Sized for an average woman's hand (7.5-8" around), although you have quite a bit of leeway in how far you felt the mittens. For example, the first pair my sister put thru just 1 cycle on her machine - they felted entirely (no stitches visible) but were a bit larger around than the pair I did which I put thru 1 short cycle in a different washing machine and then I hand felted it just a bit more (directions and ideas for this "spot" felting included in directions) because I like a wrist that is not floppy in a felted mitt and for my 7.5" circumference hands I wanted a slightly tigher fit. Directions include how to lengthen for longer fingers/thumb. If you want to knit these for a man's hand, you'll have to purchase an additional skein along with the kit. You can do that on the Umina yarn page. The kit along with one extra skein will give you enough to complete a man's hand size (8.5-9.5" circ and longer fingers).